Carling is spending £3.6m on a campaign for the next football season, offering fans £10 off official football shirts via in-store and in-pub activity, and rolling out TV ads featuring brand duo Dylan and Jon. The marketing push is designed to fire up football fever during the hiatus between seasons (from the end of May to August), and kicked off yesterday (24 June). 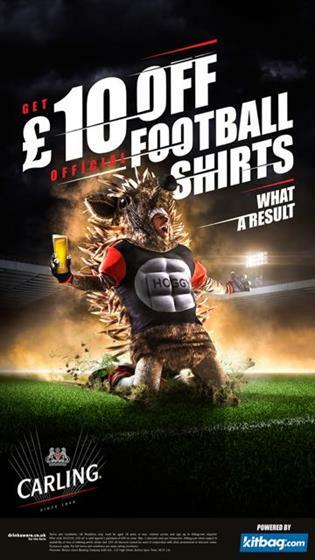 The football shirt promotion will be carried on selected packs of Carling in stores, as well as in pubs and bars across the UK. Advertising will be carried in various media, including out-of-home, TV and digital. Experiential activity featuring former Premier League and England footballer Jimmy Bullard will promote a "shirt amnesty" during the "transfer window" that will allow fans to trade in a shirt of a recently sold player for a new one, at no cost. Bullard has even agreed to appear in a pastiche of the famous image from American Beauty, lying on a bed of football shirts with his locks flowing, in a take on the movie’s image of actress Mena Suvari lying on a bed of roses. Jim Shearer, Molson Coors’ Carling brand director, said: "This new campaign targets a unique time of the year where, uninhibited by their team’s actual performance, fans have renewed hope, dreams and aspirations about the prospects of the season ahead. "In what promises to be a summer transfer window full of activity, Carling will be doing its bit to get fans ready for the season ahead, as excitement and anticipation builds." The ad campaign has been created by Creature, below-the-line has been developed by Life, while Havas SE Cake is responsible for the experiential work and PR. Media has been planned and bought by Zenith Optimedia.